The Boeing B-50 Superfortress is an American strategic bomber. 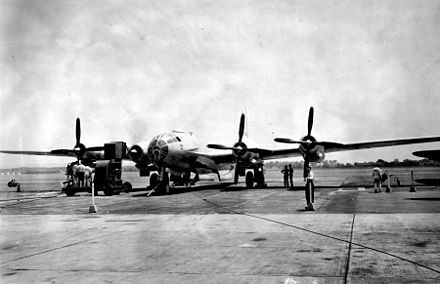 A post–World War II revision of the Boeing B-29 Superfortress, it was fitted with more powerful Pratt & Whitney R-4360 radial engines, stronger structure, a taller tail fin, and other improvements. 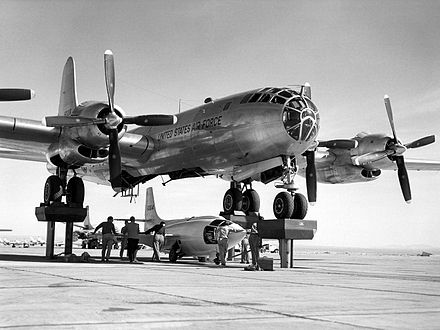 It was the last piston-engined bomber built by Boeing for the United States Air Force, and was further refined into Boeing's final such design, the B-54. Not as well known as its direct predecessor, the B-50 was in USAF service for nearly 20 years. The Boeing B-29 Superfortress is a four-engine propeller-driven heavy bomber designed by Boeing, which was flown primarily by the United States during World War II and the Korean War. It was one of the largest aircraft operational during World War II and featured state-of-the-art technology. Including design and production, at over $3 billion it was the most expensive weapons project in the war, exceeding the $1.9 billion cost of the Manhattan Project—using the value of dollars in 1945. Innovations introduced included a pressurized cabin, dual-wheeled, tricycle landing gear, and an analog computer-controlled fire-control system directing four remote machine gun turrets that could be operated by one gunner and a fire-control officer. A manned tail gun installation was semi-remote. The name "Superfortress" continued the pattern Boeing started with its well-known predecessor, the B-17 Flying Fortress. Designed for the high-altitude strategic bombing, the B-29 also excelled in low-altitude night incendiary bombing. One of the B-29's final roles during World War II was carrying out the atomic bomb attacks on Hiroshima and Nagasaki. The Pratt & Whitney R-4360 Wasp Major is an American 28-cylinder four-row radial piston aircraft engine designed and built during World War II, and the largest-displacement aviation piston engine to be mass-produced in the United States. It was the last of the Pratt & Whitney Wasp family, and the culmination of its maker's piston engine technology, but the war was over before it could power airplanes into combat. It did, however, power many of the last generation of large piston-engined aircraft before turbojets, and equivalent horsepower turboprops, supplanted it. Its main rival was the Wright R-3350 Duplex-Cyclone. 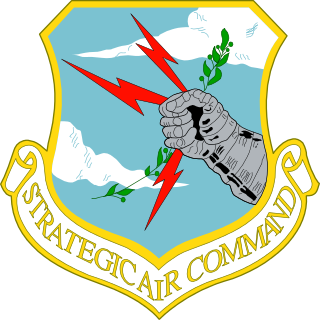 Strategic Air Command (SAC) was both a United States Department of Defense (DoD) Specified Command and a United States Air Force (USAF) Major Command (MAJCOM), responsible for Cold War command and control of two of the three components of the U.S. military's strategic nuclear strike forces, the so-called "nuclear triad," with SAC having control of land-based strategic bomber aircraft and intercontinental ballistic missiles or ICBMs. Tactical Air Command (TAC) is an inactive United States Air Force organization. It was a Major Command of the United States Air Force, established on 21 March 1946 and headquartered at Langley Air Force Base, Virginia. It was inactivated on 1 June 1992 and its personnel and equipment absorbed by Air Combat Command (ACC). In materials science, fatigue is the weakening of a material caused by repeatedly applied loads. It is the progressive and localized structural damage that occurs when a material is subjected to cyclic loading. The nominal maximum stress values that cause such damage may be much less than the strength of the material typically quoted as the ultimate tensile stress limit, or the yield stress limit. 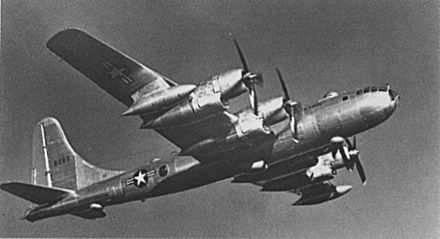 The sole XB-44 Superfortress was a converted B-29 Superfortress used to test the possibility of using the R-4360 radial engine on the latter. The Wright R-3350 Duplex-Cyclone is a twin-row, supercharged, air-cooled, radial aircraft engine with 18 cylinders displacing nearly 55 L. Power ranged from 2,200 to over 3,700 hp, depending on the model. Developed before World War II, the R-3350's design required a long time to mature before finally being used to power the Boeing B-29 Superfortress. After the war, the engine had matured sufficiently to become a major civilian airliner design, notably in its turbo-compound forms, and was used in the Lockheed L-1049 Super Constellation airliners into the 1990s. The engine is now commonly used on Hawker Sea Fury and Grumman F8F Bearcat Unlimited Class Racers at the Reno Air Races. The radial engine is a reciprocating type internal combustion engine configuration in which the cylinders "radiate" outward from a central crankcase like the spokes of a wheel. It resembles a stylized star when viewed from the front, and is called a "star engine" in some languages. The radial configuration was commonly used for aircraft engines before gas turbine engines became predominant. Peter M. Bowers was a journalist specializing in the field of aviation. Improvements to flight control systems (the B-29 was difficult to fly; with increased weights the B-50 would have been more so). The C-97 military transport was, in its 1944 prototype, essentially a large upper fuselage tube attached to a B-29 lower fuselage and wings, with an inverted figure-eight cross-section. In its production version it incorporated the key elements of the B-50 platform including, after the first 10 in production, the enlarged tailfin of the B-50. The B-29 and B-50 were phased out with introduction of the jet-powered B-47 Stratojet. 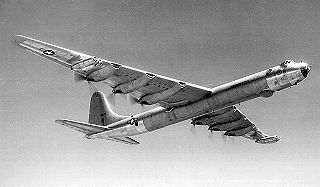 The B-50 was nicknamed "Andy Gump", because the redesigned engine nacelles reminded aircrew of the chinless newspaper comic character popular at the time. KB-50J refueling a North American FJ-4B Fury from VMA-214. 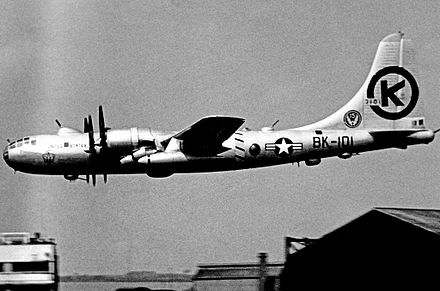 B-50 being used in the Bell X-1 test program. Boeing built 370 of the various B-50 models and variants between 1947 and 1953, the tanker and weather reconnaissance versions remaining in service until 1965. 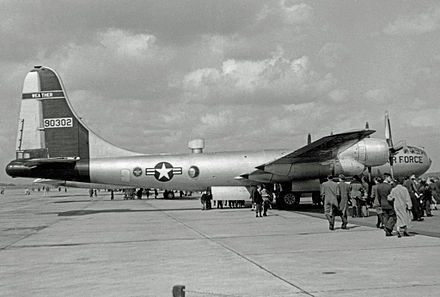 The first B-50As were delivered in June 1948 to the Strategic Air Command's 43d Bombardment Wing, based at Davis–Monthan Air Force Base, Arizona. The 2d Bombardment Wing at Chatham Air Force Base, Georgia also received B-50As; the 93d Bombardment Wing at Castle Air Force Base, California and the 509th Bombardment Wing at Walker Air Force Base, New Mexico received B-50Ds in 1949. The fifth and last SAC wing to receive B-50Ds was the 97th Bombardment Wing at Biggs Air Force Base, Texas in December 1950. The Boeing B-47 Stratojet was manufactured in large numbers beginning in 1953 and eventually replaced the B-50Ds in SAC service; the last being retired in 1955. With its retirement from the nuclear-bomber mission, many B-50 airframes were converted to aerial refueling tankers. The B-50, with more powerful engines than the KB-29s in use by Tactical Air Command, was much more suitable to refuel tactical jet fighter aircraft, such as the F-100 Super Sabre. As tankers, KB-50s would feature extensively reinforced outer wing panels, the necessary equipment to air refuel simultaneously three fighter-type aircraft by the probe and drogue method, and removal of defensive armament. 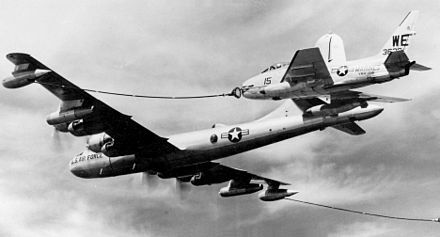 KB-50D – Prototype conversion of two B-50Ds as three-point aerial refueling tanker, using drogue-type hoses. Used as the basis for later production KB-50J and KB-50K conversions. A further conversion from a TB-50D was also designated KB-50D. Conversions to air-to-air refueling tankers with improved performance from two extra General Electric J47 turbojets under the outer wings, 112 converted from B-50D, TB-50D, RB-50E, RB-50F and RB-50G aircraft. 136 conversions to three-point hose-drogue tankers by Hayes Industries, with the auxiliary fuel tanks outboard of the engines and hose pod under the wing-tips. Tanker conversions of the TB-50H trainer aircraft. 24 converted. Proposed version of the YB-50C. Proposed reconnaissance version of the YB-50C. 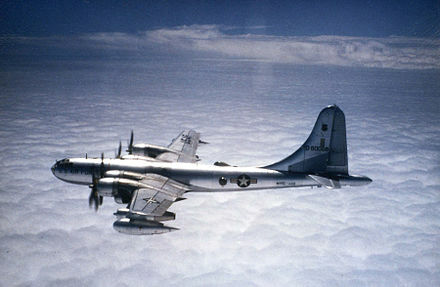 Weather reconnaissance aircraft converted from B-50A aircraft. 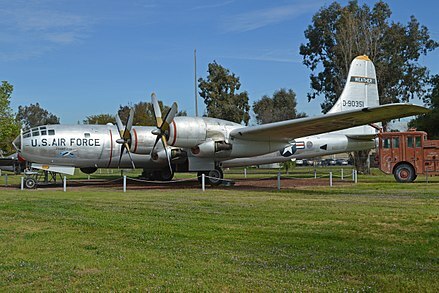 WB-50D, the Flight of the Phoenix, on display at Castle Air Museum in Atwater, California. The Boeing B-47 Stratojet is a retired American long-range, six-engined, turbojet-powered strategic bomber designed to fly at high subsonic speed and at high altitude to avoid enemy interceptor aircraft. The B-47's primary mission was as a nuclear bomber capable of striking the Soviet Union. 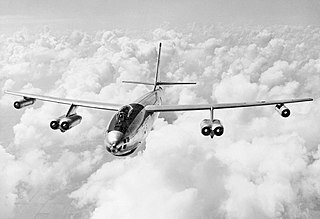 With its engines carried in nacelles under the swept wing, the B-47 was a major innovation in post-World War II combat jet design, and contributed to the development of modern jet airliners. The North American B-45 Tornado was the United States Air Force's (USAF) first operational jet bomber, and the first multiengine jet bomber in the world to be refueled in midair. The B-45 was an important part of the United States's nuclear deterrent for several years in the early 1950s, but was soon superseded by the Boeing B-47 Stratojet. B-45s and RB-45s served in the United States Air Force's Strategic Air Command from 1950 until 1959. 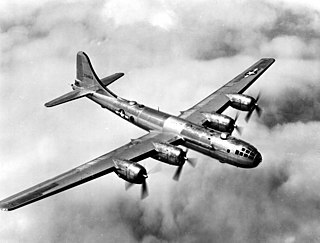 The Boeing B-29 Superfortress was produced in a large number of experimental and production models. The Boeing B-54 was an American strategic bomber designed by Boeing for use by the United States Air Force. Derived from the YB-50C Superfortress, construction of the prototype was canceled before completion, and the aircraft was never flown. 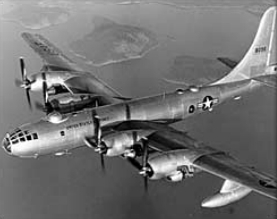 The Boeing KB-29 was a modified Boeing B-29 Superfortress for air refueling needs by the USAF. Two primary versions were developed and produced: KB-29M and KB-29P. The 58th Reconnaissance Squadron is an inactive United States Air Force squadron. Its last was assigned to the 9th Weather Reconnaissance Wing at Kirtland Air Force Base, New Mexico, where it was inactivated in 1974. The 358th Fighter Squadron is part of the 495th Fighter Group at Whiteman Air Force Base, Missouri. The squadron was reactivated there in 2015. The squadron was formerly part of the 355th Operations Group at Davis-Monthan Air Force Base, Arizona, operating the Fairchild Republic A-10 Thunderbolt II aircraft conducting close air support missions, until its 2014 inactivation. The 38th Reconnaissance Squadron is part of the 55th Wing at Offutt Air Force Base, Nebraska. It operates the Boeing RC-135 aircraft conducting reconnaissance missions. The 91st Air Refueling Squadron is part of the 6th Air Mobility Wing at MacDill Air Force Base, Florida. It operates the Boeing KC-135R Stratotanker aircraft conducting air refueling missions. The 810th Strategic Aerospace Division is an inactive United States Air Force organization. Its last assignment was with Strategic Air Command (SAC), assigned to Fifteenth Air Force at Minot Air Force Base, North Dakota, where it was inactivated on 30 June 1971. The 801st Air Division is an inactive United States Air Force organization. It was assigned to Strategic Air Command (SAC)'s Eighth Air Force at Lockbourne Air Force Base, Ohio, where it was inactivated on 15 March 1965. The 57th Weather Reconnaissance Squadron is an inactive United States Air Force squadron. Its last assignment was with the 9th Weather Reconnaissance Wing at Hickam Air Force Base, Hawaii, where it was inactivated on 10 November 1969. The 421st Air Refueling Squadron is an inactive United States Air Force unit. It was last assigned to the 41st Air Division at Yokota Air Base, Japan, where it was inactivated on 18 February 1965. The 427th Air Refueling Squadron is an inactive United States Air Force unit. It was last assigned to the 4505th Air Refueling Wing at Langley Air Force Base, Virginia, where it was inactivated on 1 April 1963. The 429th Air Refueling Squadron is an inactive United States Air Force unit. It was last assigned to the 4505th Air Refueling Wing at Langley Air Force Base, Virginia, where it was inactivated on 8 October 1963. ↑ Knaack 1988, p. 174. ↑ "Serial Number Search, B-50 48-065." rcn.com. Retrieved: 8 August 2010. 1 2 3 Knaack 1988, p. 163. 1 2 3 4 5 6 7 8 9 Bowers, Peter M. (1989). Boeing aircraft since 1916 (3rd ed.). London: Putnam. pp. 345–352. ISBN 0851778046. 1 2 "Boeing/Pratt & Whitney XB-44 factsheet." Archived June 20, 2008, at the Wayback Machine National Museum of the United States Air Force. Retrieved: 27 June 2010. 1 2 Peacock 1990, p. 204. ↑ "XB-44 Superfortress Factsheet." Archived June 20, 2008, at the Wayback Machine National Museum of the United States Air Force. Retrieved: 28 December 2012. 1 2 Knaack 1988, pp. 181–182. ↑ Willis 2007, pp. 162–163. ↑ Willis 2007, p. 162. 1 2 Peacock 1990, pp. 205–206. ↑ Willis 2007, pp. 156–158. ↑ Knaack 1988, pp. 186–187. ↑ "On Permanent Alert." Popular Mechanics, November 1950, pp. 91–94, see bottom page 92. 1 2 3 Ravenstein, Charles A. Air Force Combat Wings Lineage and Honors Histories, 1947–1977. Maxwell AFB, Alabama: Office of Air Force History, 1984. ISBN 0-912799-12-9. ↑ Baugher, Joe. "Boeing B-50B Superfortress." USAF Bombers: Boeing B-50 Superfortress, 17 June 2000. Retrieved: 8 August 2010. 1 2 "Boeing F-13A / RB-29A / RB-50." Archived 2018-09-30 at the Wayback Machine Spyflight.com. Retrieved: 8 August 2010. ↑ Baugher, Joe. "Boeing KB-50 Superfortress." USAF Bombers: Boeing B-50 Superfortress, 17 June 2000. Retrieved: 8 August 2010. ↑ Baugher, Joe. "Boeing WB-50D Superfortress." USAF Bombers: Boeing B-50 Superfortress, 17 June 2000. Retrieved: 8 August 2010. ↑ "Boeing B-50A Factsheet." Archived June 16, 2012, at the Wayback Machine National Museum of the United States Air Force. Retrieved: 28 June 2010. 1 2 Peacock 1990, p. 205. ↑ "B50B Factsheet." Archived July 5, 2012, at the Wayback Machine National Museum of the United States Air Force. Retrieved: 28 June 2010. ↑ "Favonius." "American Notebook: Some Caterpillars Fly." Flight , 7 July 1949, p. 24. ↑ "RB-50B Factsheet." Archived June 16, 2012, at the Wayback Machine National Museum of the United States Air Force. Retrieved: 28 June 2010. ↑ Knaack 1988, p. 177. ↑ "YB-50C Fact sheet." Archived August 6, 2009, at the Wayback Machine National Museum of the United States Air Force. Retrieved: 28 June 2010. ↑ "B-50D Factsheet" Archived June 16, 2012, at the Wayback Machine . National Museum of the United States Air Force. Retrieved: 28 June 2010. ↑ "DB-50D Factsheet." Archived June 16, 2012, at the Wayback Machine National Museum of the United States Air Force. Retrieved: 30 June 2010. ↑ "KB-50D Factsheet." Archived August 6, 2009, at the Wayback Machine National Museum of the United States Air Force. Retrieved: 30 June 2010. 1 2 Peacock 1990, p. 206. ↑ "TB-50D Factsheet." Archived August 17, 2011, at the Wayback Machine National Museum of the United States Air Force. Retrieved: 30 June 2010. ↑ "Boeing WB-50D Superfortress." Archived November 15, 2007, at the Wayback Machine National Museum of the United States Air Force. Retrieved: 30 June 2010. 1 2 Peacock 1990, p. 207. ↑ Knaack 1988, pp. 195–196. ↑ "Boeing RB-50E." Archived August 6, 2009, at the Wayback Machine National Museum of the United States Air Force. Retrieved: 30 June 2010. ↑ Knaack 1988, pp. 178–179. ↑ RB-50F Factsheet." Archived August 8, 2009, at the Wayback Machine National Museum of the United States Air Force. Retrieved: 30 June 2010. 1 2 Knaack 1988, p. 179. ↑ Knaack 1988, pp. 197–199. ↑ "B-50 Superfortress, s/n 46-010 'Lucky Lady II'." Archived 2017-08-06 at the Wayback Machine Planes of Fame Museum. Retrieved: 13 April 2012. ↑ "WB-50D Superfortress, s/n 49-0310." National Museum of the United States Air Force. Retrieved: 14 December 2017. ↑ "WB-50 Superfortress, s/n 49-0351." Castle Air Museum. Retrieved: 14 December 2017. ↑ "KB-50 Superfortress, s/n 49-0372." Pima Air & Space Museum. Retrieved: 9 April 2012. ↑ "KB-50J Superfortress Restoration Underway" Air Mobility Command Museum Retrieved: 04 February 2018. ↑ Maurer, Maurer, ed. (1982) . Combat Squadrons of the Air Force, World War II (PDF) (reprint ed.). Washington, DC: Office of Air Force History. ISBN 0-405-12194-6. LCCN 70605402. OCLC 72556. .
↑ Tabaco, Joseph. "Air Force Weather Reconnaissance Organizational History." Archived July 13, 2010, at the Wayback Machine tabacofamily.com. Retrieved: 23 August 2010. ↑ "Tactical Tankers: KB-29/KB-50, 1953–1965." TAC Tankers.Com. Retrieved: 23 August 2010. ↑ Knaack 1988, pp. 200–201. Bowers, Peter M. (1989). Boeing aircraft since 1916 (3rd ed.). London: Putnam. pp. 345–352. ISBN 0851778046. Peacock, Lindsay. "The Super Superfort". Air International , Vol. 38, No 4, April 1990, pp. 204–208. Stamford, UK: Key Publishing. ISSN 0306-5634. Willis, David. "Warplane Classic: Boeing B-29 and B-50 Superfortress". International Air Power Review, Volume 22, 2007, pp. 136–169. Westport, Connecticut: AIRtime Publishing. ISSN 1473-9917. ISBN 978-1-88058-893-2. Hays, Geoffrey (2013). Boeing B-50. Air Force Legends. Nº215 (First ed.). California, United States: Ginter Books. ISBN 978-0-9846114-9-2 . Retrieved 1 February 2015. Wikimedia Commons has media related to B-50 Superfortress .